The shiny finish is less conductive because of the additives used for that finish when plated. However that is not a great issue when you take into account the material underneath, cable construction and any other plated layers – we still end up with a very transparent cable assembly. It is all a very carefully balanced set of ingredients that become more than the sum of their parts. World-wide premium reputation & hand built in Britain – these are just two of many reasons why Tellurium Q® wants their clients to have confidence that they own authentic, high performance cables. 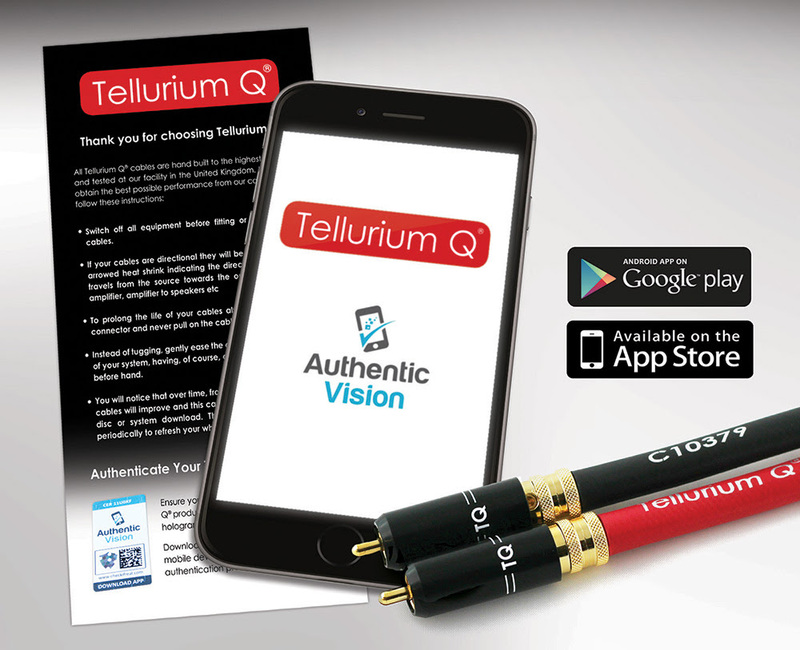 Tellurium Q® and Authentic Vision have joined forces to enable customers to securely check the authenticity of their cables just by scanning the warranty card with the Check If Real App – free to download at the App Store for iOs or Google Play store for Android. “We have chosen Authentic Vision because of the concept they are bringing to the market. Such a simple yet effective use of technology to benefit our customers. There is always a danger of any manufacturer’s product being counterfeited, that is just a fact of life in this day and age. So we have decided to act proactively and safeguard our customers before it ever becomes an issue and with Authentic Vision on our side it never has to." An online system driven from encrypted physical labels that allows our customers to instantly check product authenticity for themselves just by scanning the product with the Check If Real app on their smartphone. “We are particularly happy that Authentic Vision was able to work with Tellurium Q® and ensure all the customers about the origins of their purchase without any lengthy processes or examinations – one scan is enough – which is the easiest to use authentication solution for customers worldwide.” Says Peter Kostur, VP of business development at Authentic Vision. One: Tellurium Q®’s warranty cards has an Authentic Vision label - a highly secure, irreproducible configuration combining randomised 3D holographic image with an encrypted datamatrix. Two: The Check if Real smartphone app instantly authenticates your product as genuine. Three: Direct and automatic access to product registration and extended warranty the instant that you authenticate the product using Authentic Vision. Authentic Vision is essentially a new system developed to authenticate and protect products from grey imports and give customers confidence that they have the genuine article. Tellurium Q was approached by Authentic Vision to pioneer and partner this game changing technology because of the reputation of their products. This is being rolled out into the UK later this September and the rest of the world in October.